with my brave men, my sword in my right hand." Two men, who lived and fought some 50 years apart, on opposite sides of the world, were both great heroes and martyrs against the Red Scourge. Both men led their people against an enemy who knew and still knows nothing about honour or cares much for such "soft" ideas. But evil rarely does. General Robert E Lee and Admiral Alexander Vasielovich Kulchak were both great men, who rose through the ranks in honourable and loyal service to their ideals and their people. Both risked their lives in battle, gaining the loyalty of their soldiers and their people. Both lost, one dieing in disgrace shortly after and the other murdered by the Red Beast. Both served Christ in all of their lives and served with unwavering loyalty. Both men fought brilliant land battles (yes Admiral Kolchak did command armies) and both were on the brink of victory when a combination of factors, to include foreign allies who betrayed them, drove them to defeat. Both men cared about their armies and their men but fought an enemy quite happy to bury them in bodies of ill trained soldiers who were seen by their Red Masters as expendable assets and nothing more. Meat for the butchery. Both lost because they fought with honour against an enemy that had no such whims and would and could and did anything and everything to instill their radical Marxist ideology. America was some what lucky, in that after the American Civil War, the Red Lincoln dictator was assassinated and in that wake, the some ground was won back from the Marxists Republicans. However, over the next 140 years, the Marxists, first in the guise of the Radical Republicans, than in the Liberal Democrats and finally as both, are reaching the final point of take over anyways. In Russia, we were less lucky, the grind of Marxism came hard and heavy, shortly after Admiral Kulchaks defeat.We suffered under that evil curse for 70 years and still feel the linger claws of its deathly grip and the curse of the revisionists still in our midst. Both man were and still are slandered and bemoaned as evil, while the Marxist animals such as Lincoln and Lenin are still pushed by a leftist liberal intelligentsia, morally and intellectually bankrupt, self centered and deprived. However, first in quite corners and ever more so in the open, both men and their legacies are enjoying a new rebirth of Godly truth. In light of this, the question thus becomes: how much longer? How much longer will the Right continue to retreat? Continue to humour itself into the belief that surely, surely its enemies can not be as bad as you think. I say to you, surely as the Saints are in Heaven, are the minds and leaders of the Left the sons of Lucifer, the Servants of Baal, evil and nothing but evil. It is time to grab your cross, your icons and stand and never back off, for the Red menace will not leave all its own and its thirst for the blood of innocence has never and will never know satisfaction, for in the eyes of these soulless fools, they are the just and historically correct and we nothing but road blocks on the their holy enlightened path to Utopia. Best post you've yet done. One caveat..."anyways" is not an English word. "Anyway" is correct. Grant was totally insensitive to losses on the ground. If he lost 5000-10000 in a single day, he simply wired Lincoln to send him another 5 or 10 thousand replacements and loaded his dead aboard railroad boxcars for shipment back North to their families. As such he was the ideal tool to serve the Union in persuit of decimating the Confederacy. It mattered little that some families on both sides of the Mason-Dixon had lost 4-5 of their sons. There was no price too high. Probably where the expression "cannon fodder" originated. The lives being lost in persuit of some damn fool policy never matter to the politician. One thing you've got to keep in mind- American youth get extra-curricular (outside our Hegelian dialectal, Outcome Based Education system) education from television. "PBS": Public Broadcasting System, which is fraught with Marxist & "multiculturalism" Darwin's theory as science, and total lack of anything Christ. PBS has a lot of documentaries- and the South vs North Civil War ones are popular. Great opportunity for PBS to indoctrinate minds with new world order/antichrist newspeak. Walmart is not as bad as the pictures- and it's all a ruse to demean the Christian southerner- part of the Zionist mockery of all things Christian white American. Thank you for your kind words. 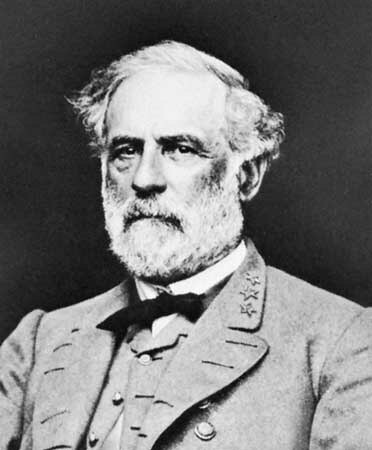 As a Southerner I always respected and admired General Lee. The parallel with your Russian general is instructive. Southerners and Russians have always had something in common. God bless you. Robert E. Lee is the epitome of excellence in spirit and soul. How foreign are his words today: Duty is the most beautiful word in the English language. Our only hope now is that some states, intolerant of the totalitarian left, will secede and form a new country that follows the Constitution and does not demonize its own citizens in the name of multiculturalism. I'd be interested if you had time someday to explain further how you see Lincoln as a Marxist. That statist POS Ape Lincoln was a penpal of Karl Marx. This is the first time I have read anyone who referred to Aba Lincoln as a Marxist. On what facts do you base this allegation? "The Single-minded son of the working class" as Marx described Lincoln. Look up my article under the link Lincoln. Also there are several books on this: Idiots Guide to the Civil War, Red Republicans and so on. Comrades don't be upset if someone doesn't buy into the Ape Lincoln mythology. Just drink the kool-aid and tell yourself the civil war was about ending slavery. The comment said Ape Lincoln exchanged a letter or two with Karl Marx not that Ape Lincoln was a marxist. My dear sir, oh how you focus on the reality that almost no others have understood. This is a brilliant post, as important as the one on "Americans never give up your guns". The fact is that America is, to use Peter Brimelow's phrase, under a "Minority Occupation Government" Obama is a puppet, the real Marxists, the LITERAL DESCENDANTS of the Bolsheviks are the ones who pull his puppet strings, people like Rahm Israel Emanuel, David Axelrod, Betty Lu Salzman, et al. Long have I admired the Tsar and his family, he was a man of rare quality and in these dark days it is rare to think we can find a leader such as he. The Bolsheviks slaughtered that family like hogs. This cannot ever be forgotten nor should it be forgiven. I've been reading The Last Days of the Romanovs, by Robert Wilton and in that book he documents the evil that was perpetrated not just against that holy and good family, but against the Russian people, particularly the good and the devout. I thank God that we got to know the White Russians who had escaped and who told the truth. Russia has suffered, long and bitter, but Mother Russia will regain her place, and Christ will lead you to that success. We look to RUSSIA, now, as the bulwark against this revival, in the US, of the Bolsheviks. May God bless you and your family and Russia. You understand American history better than 98% of the American people. Thanks for providing the quote by Robert E. Lee for which I had been looking.